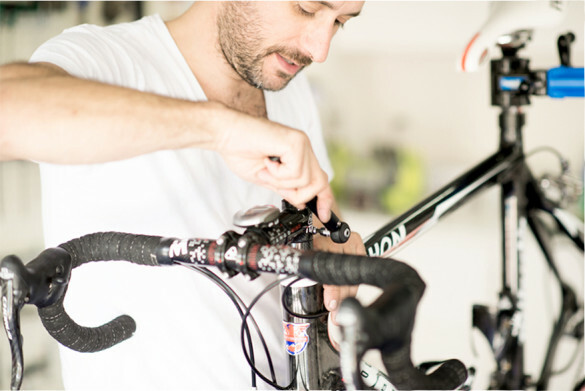 If you’re a regular rider, you’ll know that routine bike maintenance increases the life of your components, minimises the chance of on-road mechanical failures and maximises your bike’s efficiency, so more of your effort translates into speed on the road. Elbows Akimbo understand the difference a high-quality bike service can make. That’s why we only use the best quality products and tools. Our modern workshop is stocked with genuine parts from the world’s leading brands and is home to the latest state-of-the-art tools, cleaners, degreasers and lubes for each specific application. Not only do we guarantee the quality of our workmanship, but with many years of experience and a perfectionist’s approach to detail and care, you can be confident that your bike is in good hands. We offer a range of bike servicing packages to meet your requirement. Our Standard and Premium packages include the complete removal and degrease of all drive chain components as well as a wash of the stripped down frame and wheels. This allows us to safely and thoroughly clean your bike so that it not only runs smoothly but also looks immaculate. Prices do not include the cost of parts. Bike servicing and repair items are also available on an individual basis. Please contact us on 0427 820 256 or service@elbowsakimbo.com.au to make an enquiry and/or booking.